The EcoPaperLoop Project has come to an end. The final Outcome and Recommendations book is available for download and also as a hardcopy on request. All Guideline Documents will also be available in German, Italian, Hungarian, Polish, and Slovene. in the Central2013 Portraits book. More details and the presentations are available on the conference website. How good is your box after use? 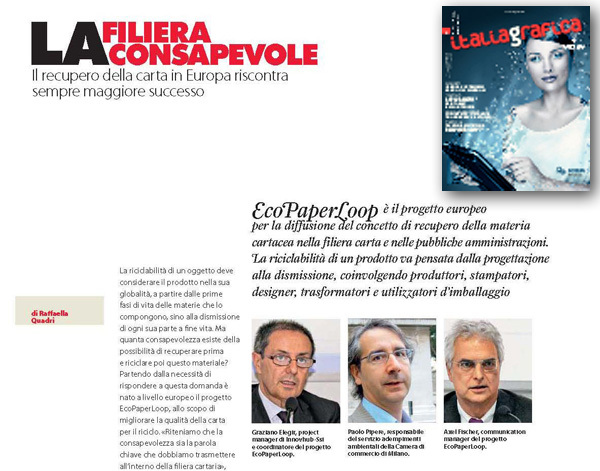 2nd issue of the EcoPaperLoop Newsletter "Awareness"
See details on the partner pages! 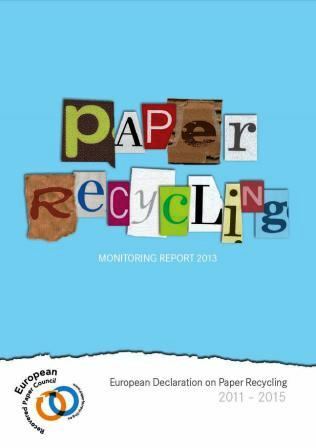 2013 Monitoring Report of the ERPC. in German at PTS München, 11:30—16:00 hrs — click here for all the details! Seminar in deutscher Sprache in der Papiertechnischen Stiftung in München — Details hier! You missed it, but all the information will be available online: EcoPaperLoop Seminar July 9, 2014 in Sopron, Hungary,for everybody in the paper chain: recyclers, printers, publishers or agencies as well as packaging converters or representaives of administrations dealing with paper and packaging collection! The two day event consisted of a seminar with brain storming session and a practical workshop. The presentations of the seminar and workshop are available for download! is available in English, German, Hungarian, Slovene, Italian and Polish. 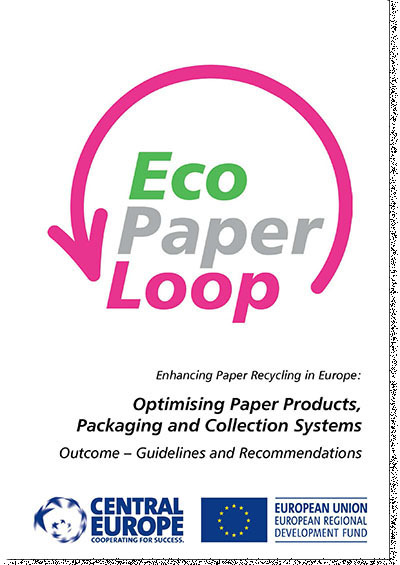 Last EcoPaperLoop Seminar Oct 29, 2013 in Warsaw, Poland, for everybody in the paper chain: recyclers, printers, publishers or agencies as well as packaging converters — more information here. EcoPaperLoop seminar "Together we can improve ecological paper loop" in Ljubljana on Feb 14, 2013 — more information in Slovenian here. Presentations about EcoPaperLoop at the INGEDE Symposium in Munich on February 13, 2013 by Graziano Elegir (Project Leader), Harald Großmann and Dennis Voß. 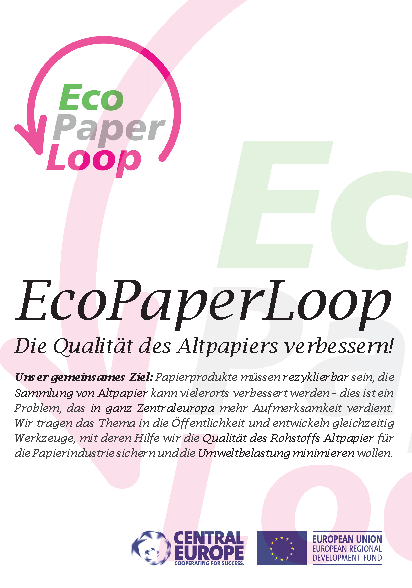 For project partners only: EcoPaperLoop Recyclability Seminar on January 22nd and 23rd, 2013 at PMV lab in Darmstadt. A detailed introduction into the proposed Recyclability Method for Packaging Papers. More information on the partners only page. Graziano Elegir, Dr. Hans-Joachim Putz and Prof. Harald Großmann gave an outline of the project. The presentations are available here! For first press release please scroll down! NEW: "You Impresa" Business TV Camera di Commercio Milan has a video about the kick-off press conference. See all media coverage here. 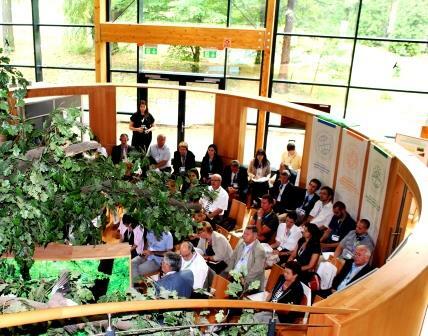 One of the main driving forces to effectively implement high valuable paper recycling strategies in given regions is the ‘Environmental awareness of the society’. 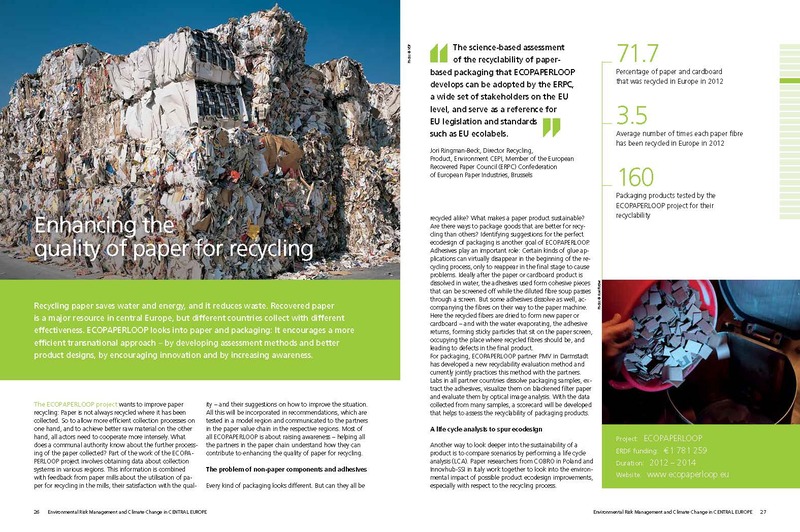 Nonetheless, in this context, recovered paper quality is THE key element: On one side preventing constrains during paper recycling operations and securing good quality raw material for the paper industry, and on the other side reducing the environmental impact (e.g. the better is the secondary raw material the lower is the environmental impact of its treatment) of the regions thus obtaining social benefits. In Central Europe regions recovered paper is a major resource (secondary raw material), however, the paper recycling rates are still highly inhomogeneous. Since recovered paper is not only recycled in the country where it is produced some essential features such as ecodesign and eco-collection concepts must be developed at transnational level to increase the sustainability of the paper loop. This is, as the project has just been approved, a first very basic website. Come back later for more information. To be in line with the European Data Protection Guidlines, the links to Linkedin and Twitter here have been removed. You can still follow us on Twitter ("Ecopaperloop") and look for INGEDE on Linkedin. We maintain this website to enhance public access to information about its initiatives and policies in general. Our goal is to keep this information timely and accurate. If errors are brought to our attention, we will try to correct them. However, we accept no responsibility or liability whatsoever with regard to the information on this site. sometimes linked to external sites over which INGEDE/EcoPaperLoop has no control and for which we assume no responsibility. In order to protect your privacy, this website does not use tracking cookies or mechanisms like Google Analytics. The webpages on this site can have a contact button or contact link, which activates your email software and invites you to send your comments to us.